My students absolutely love this lab! 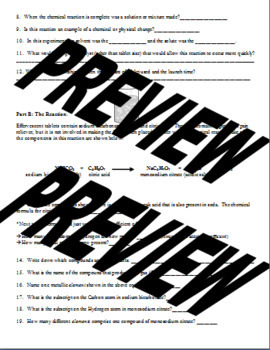 This activity serves as a wonderful Chemistry review keeping the students fully engaged. 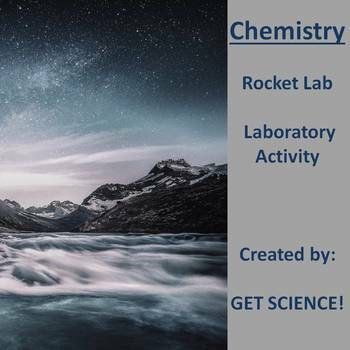 Students will learn about the chemical reaction taking place with Effervescent tablets as they analyze the compounds and learn the reactants and products. Such topics as catalysts, counting atoms, solvent vs. solute, etc. are explored. Materials needed: Film canisters, Effervescent tablets, safety goggles. 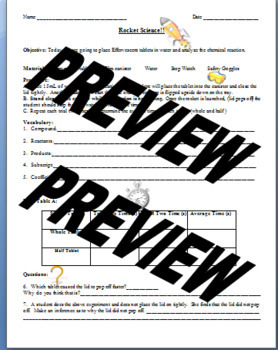 You may edit this worksheet and the key is included.